Facts about bluegill fish. "Scientific name for bluegill fish is Lepomis macrochirus". 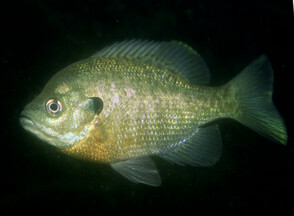 Other names for the bluegill fish such as Bream, sunfish, blue bream, sun perch, blue sunfish, brim, copper nose, red eared sunfish, red breasted sunfish, pumpkinseed and green sunfish. The bluegill fish is most related to the orangespotted sunfish and the redear sunfish, but different in a pronounced spot at or near the base of the soft dorsal fin. A pond fish that is a species of freshwater fish. The bluegill typically ranges in size from four to 12 inches (19 to 30.5 cm), and reaches a maximum size just over 16 inches (40.6 cm). Bluegill fish are a member of the sunfish family (Centrarchidae) of the (order Perciformes means one of the largest natural groups of fishes of both marine and fresh water: true perches; basses; tuna). Lepomis, in Greek, means "scaled gill cover" and macrochirus means large hand, which may be a reference to its body shape. The bluegill has a very round profile and seems to be very dense for its size. Colors often vary between each fish in a group, but there are consistent markings of some vertical bars on the sides of the bluegill fish, a blue tinge to the bottom of the gill plates and a black spot on the back of the gill cover that is not tinged with any other color. The colors are very pronounced in the males when they are spawning. The bluegill fish is mostly known for the bright blue edging visible on its gill. bluegill fish was first found in the eastern half of the United States and in northeastern Mexico, you can find bluegill fish now in most everywhere and is the most popular panfish species in America. Bluegill Fish Size - World record is 4 pounds, 12 ounces (1.86 kg) and was caught in 1950. It has a small mouth and eats bugs and small fish. Bluegill fish will eat almost anything they can get in their mouth, including worms, small minnows, insects and crayfish. bluegill fish can be caught on all kinds of live bait including small minnows, earthworms, crickets, meal worms and freshwater shrimp. Artificial bait good for bluegill are small spinners, corn, rubber worms, jigs as well as all kinds of dry and wet flies. bluegill fish will spawn when the water they live in is over 65 degrees Fahrenheit (18 cel) on the full moon bluegill fish will spawn. They will spawn every full moon from March to September in some southern states and all through out the year in Florida.